Professionally produced by HDE Agency in partnership with El Palacio of Chandler, the Rockin’ Taco Street Fest will return for its fifth year on Saturday, September 17, 2016 from 12-9 p.m. This year, the fest has moved to the Dr. AJ Chandler Park, 3. S. Arizona Ave in Downtown Chandler. The new location will allow us to expand and grow this fantastic festival into a cultural experience for the entire east valley to enjoy. We’ve added more of everything including taco vendors, bands, activities and fun,” said Landon Evans, event coordinator. 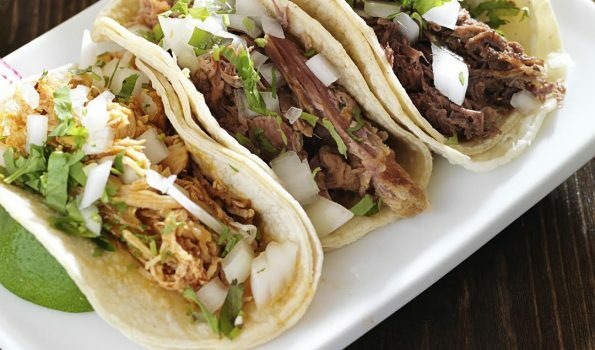 To accompany all of those delicious tacos, patrons will enjoy local craft beer, fresh fruit fresca, Mexican cerveza, tequila tastings, margaritas and more. Plus, save room for elote, churros, Mexican candies, kettle corn and more! Ballet Folklorico Dancers 12-12:30 p.m. The Deep Down 2-3 p.m.
Lucha Libre Wresting 3-8 p.m.
Tommy Price & the Stilettos 6-7:15 p.m.
Santana Tribute Band 7:30-9 p.m.
Other event highlights include: a taco eating competition, a salsa competition, Chihuahua races, niños play zone and a piñata party. Doors open at noon, general admission to the Rockin’ Taco Street Fest is $8 online during presale and $10 day of. Children 12 years old and under will be admitted for free with a paid adult. A limited number of VIP admission tickets are available online ONLY, while supplies last. VIP Admission is $65 and includes six alcoholic beverages, unlimited soft drinks and water, catered food from El Palacio Restaurant & Cantina of Chandler, private restrooms, front stage access/view, private seating. VIP is a 21 and over entry only. Tickets are available online now at www.RockinTacoAZ.com. Be sure to visit the Fest social pages @RockinTacoAZ for more vendor announcements. Special thanks to the official sponsors of the Rockin’ Taco Street Fest for their support: El Palacio Restaurant & Cantina of Chandler, SanTan Brewing Company, Downtown Chandler, Alta Steelyard, Corona light, Modelo Especial, Pacifico, Yelp, Bravo Tipping, Boost Mobile, Yellow Cab, BLK Live, Arizona Canine Center, Earnhart Chrysler Jeep Dodge Ram, Hubert’s Lemonade, Modern Margarita, Tequila Cabrito and Clasico de Centinela. A percentage of the proceeds from the Rockin’ Taco Street Fest will benefit the Downtown Chandler Community Partnership (DCCP), a 501(c) 6 nonprofit corporation whose mission is to mobilize leadership and resources to advance the development of downtown Chandler as a regional destination for shopping, dining, living, culture, and the arts. It works on behalf of the Enhanced Municipal Services District, created in 2006, to provide enhanced marketing and promotion, safety and beautification of the downtown area beyond what is done by the City of Chandler. For more information, visit www.downtownchandler.org.